As an unattached person, you have the freedom to make your life whatever you want it to be. Your only challenge is to become empowered by that freedom! 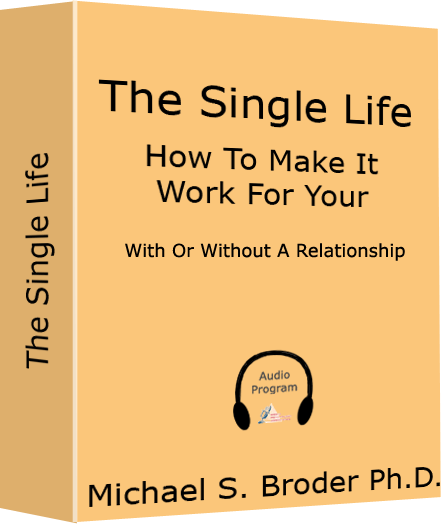 Regardless of whether this is the first time in years you’ve been single or you have been single your entire life, some tools for smoothing out the inevitable rough edges that are often a part of single life can make a crucial difference. In this interactive audiotherapy program, Dr. Broder presents an array of brand new and powerful strategies for mastering all aspects of your life on your own that he developed since the publication of his classically acclaimed book The Art Of Living Single. 12 proven strategies that will put your entire winning approach together for you. This powerful and highly acclaimed audiotherapy self help program in MP-3, CD or cassette format is used by people around the world to to handle everyday anxiety. It is also for those who suffer from generalized anxiety disorders, performance anxiety, social anxiety, anxiety attacks, test anxiety, communication anxiety and other symptoms and issues that are anxiety related. Overcoming Your Anxiety is also used, recommended and highly endorsed by therapists, life coaches, physicians and other professionals everywhere to help those who need information, advice and strategies on how to permanently eliminate the self doubts and attitudes that underlie anxiety in all of its forms. The audio program contains many proven cognitive behavioral strategies for dissolving anxiety and panic right on the spot as well as long term solutions for conquering anxiety at its roots and when professional treatment is warranted, along with a discussion of the types of treatment that are most effective.